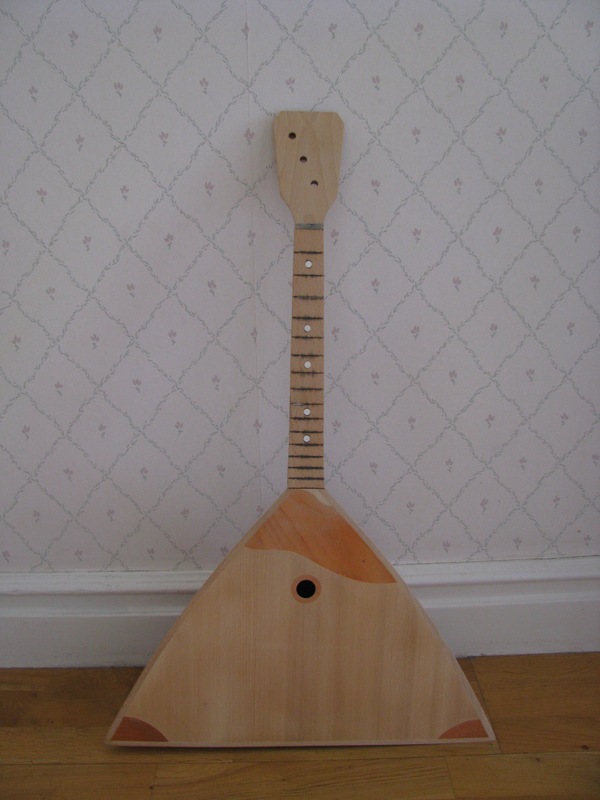 Currently I own six balalajkas, two turist models, two concert balalajkas, one 6-string balalajka and one electric balalajka. When I counted them I could not really believe that it has escalated so fast, on average I have bought an extra balalajka every 6 months. In total I have bought balalajkas for a value of 4397 SEK. (This equals $650 or €530). 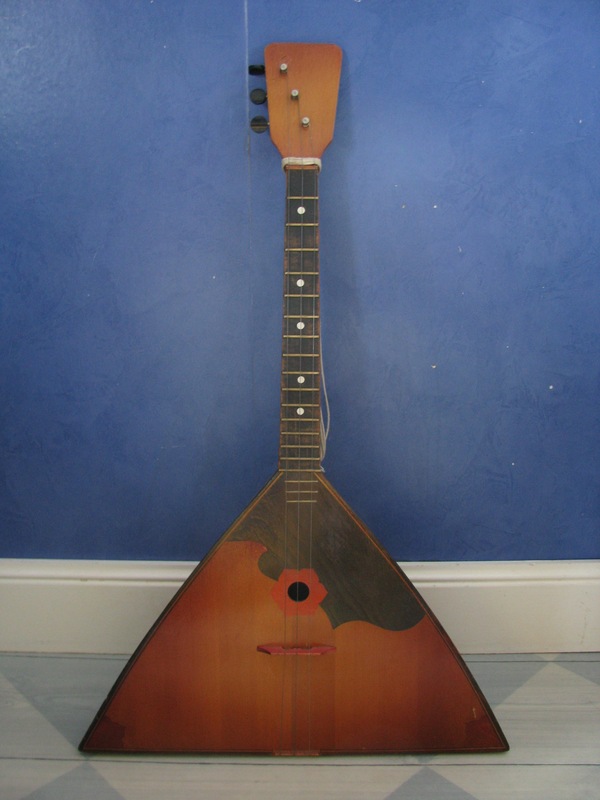 This is the first balalajka that I ever bought, it is perhaps not the best model, but it has worked sufficiently well the years I have used it. I bought it for 200 Swedish crowns, approximately $30 or €24, this was in January 2009. 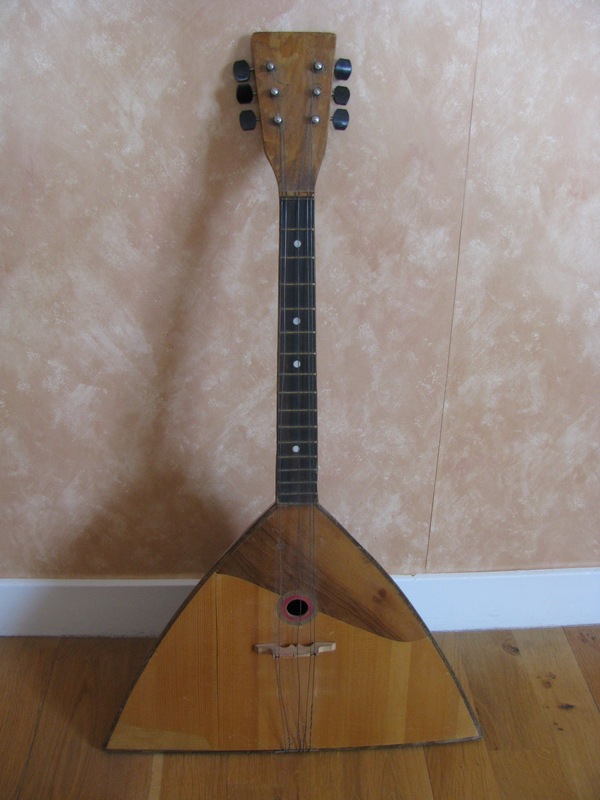 I bought this balalajka during my project of building my electric balalajka, my plan is/was to also make this one electric with piezo pickups aswell as to restore it to perfect condition. 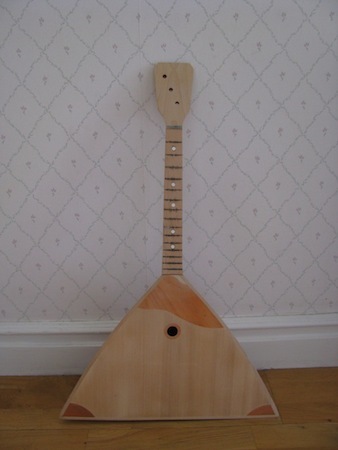 So far I have only grinded the body and removed the old frets, though I am still considering reusing them. This project will not be finished for a long time, but when I have I will make a separate section for this. 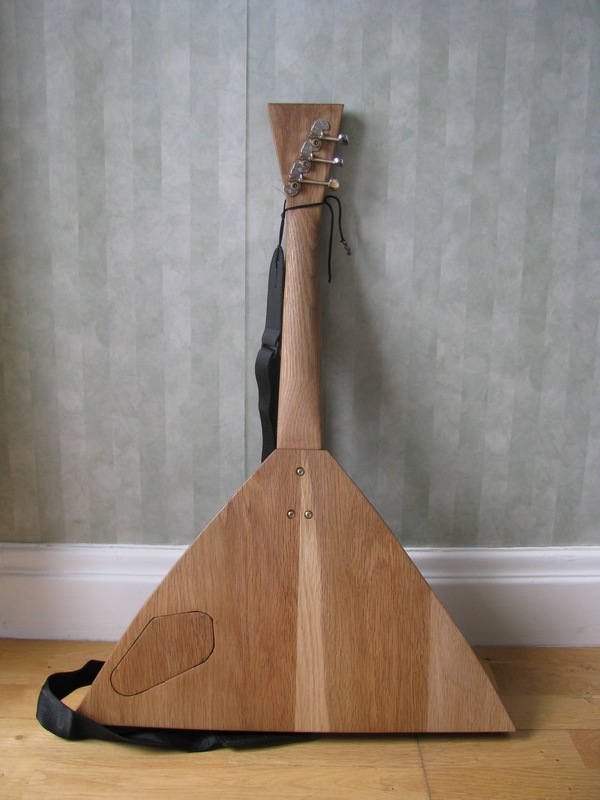 I got interested in doing this after having seen Kirills acoustic balalajka modification, please see existing electric balalajkas. I paid 205 SEK (120 SEK plus 85 SEK in shipping) approximately $30 or €24 for this one. (14-01-2011). Two frets was missing and the bridge is was just a piece of rough wood. A few scratches and damages here and there, but in working condition with no cracks or similar. I will upload more pictures of the damages that existed the day I am finished and have created an own section for it. This purchase proves that there is no market for selling balalajkas, at least not in Sweden. The seller had this out for sale nearly 6 mouths before I bought it and in my opinion this was a very good deal. 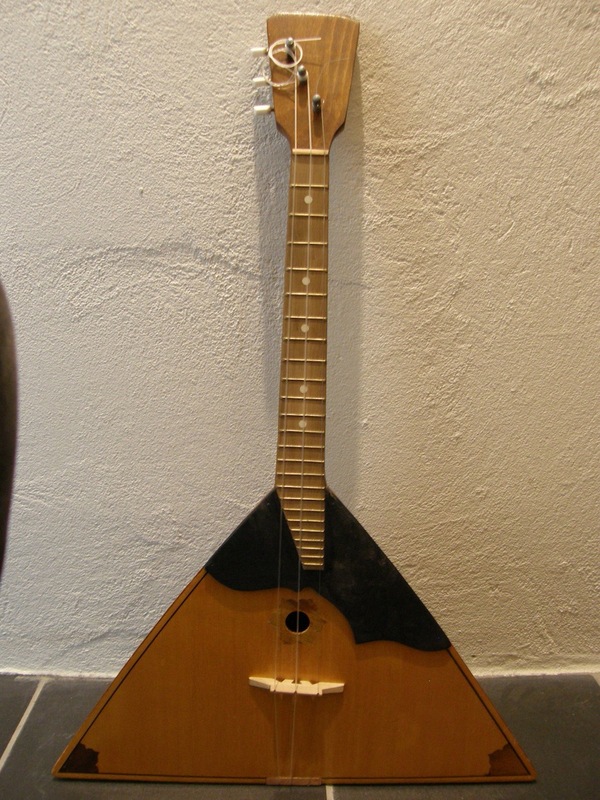 It has probably been hand-made by a luthier, it is not in absolute perfect condition, there are a few scratches here and there, but nothing big or serious. It sounds great, though the old/aged strings tricked me a bit when I first test played it, at least I got a nice suprise later on. 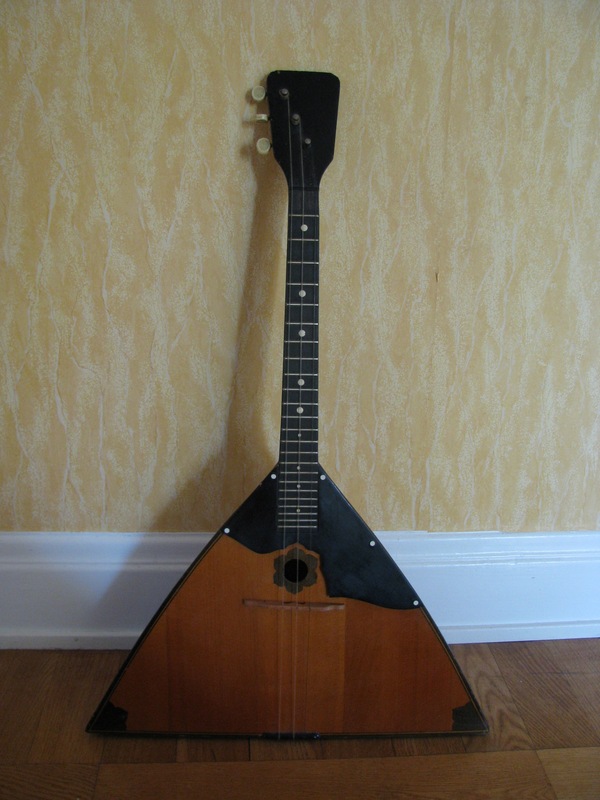 My first impression was that the pickguard seems a bit out of place as if it has been exchanged, but I do not really know. The quality of this build is very high, and I must say that I am very impressed with it. 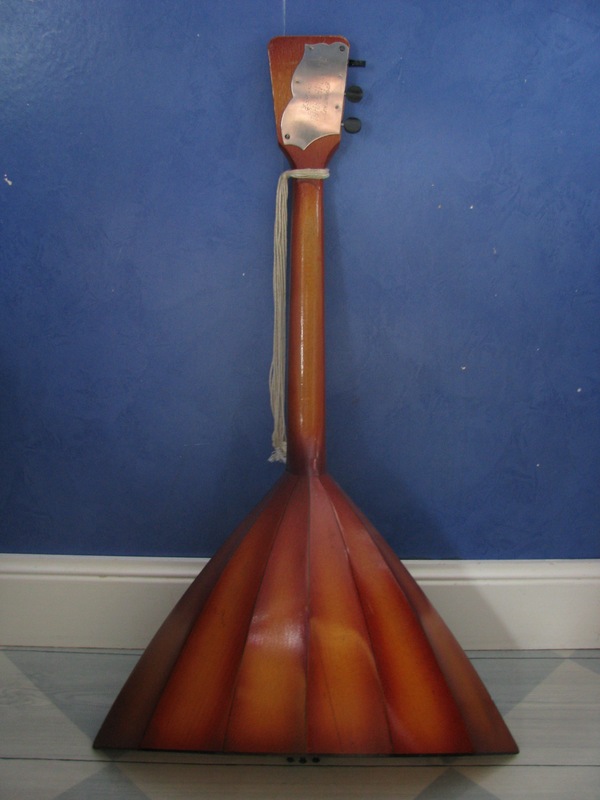 This balalajka has two whole octaves and a picguard and a decoration at the back. Most likely this was created in mass-production, number 651?. 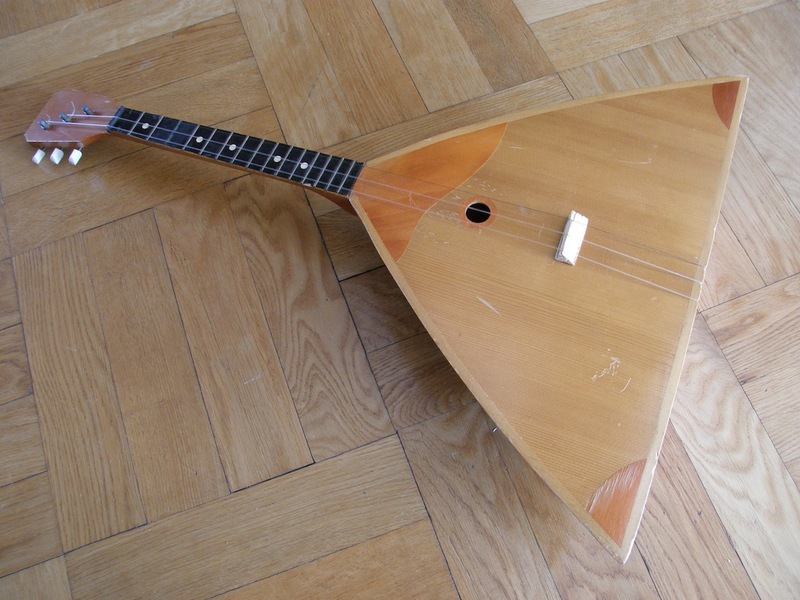 The quality is not impressive, but it is a good instrument anyway. There are quite a few scratches here and there, and the strings needed to be exchanged. 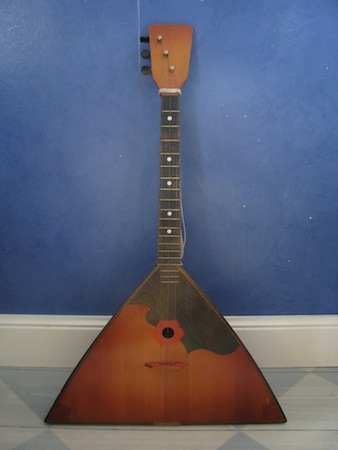 I bought this balaljaka through and Internet auction, and I must say that I got scammed. The seller was (and probably still is) a complete arse with a rotten behavior, and would not accept any resonsibility at all for his lies. My original plan was to take this into a small-claims court, but I soon realized that they probably would not have afforded to pay the legal fees, as they would have had to pay the court expenses. In the auction the seller stated that this balalajka was in absolute mint conditon, and the pictures he had taken also seemed to confirm this. The damages on it couldn't possibly been from shipping damages, there are several cracks right through the wood, because of this the body plate bulges outwards and there are very many scratches, the wooden structure inside the body is defective etc. It looks much better on my pictures than in reality. Here are some pictures of it. 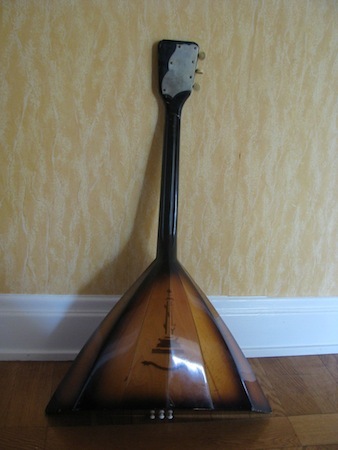 If and when I repair the instrument, I will publish detailed pictures of the damages. This is the reason to why I created this homepage, I built it between 2010 and 2011, more details about the build can be found throughout the page. The body is made from oak, the fretboard ebony and the pickguard from beech. 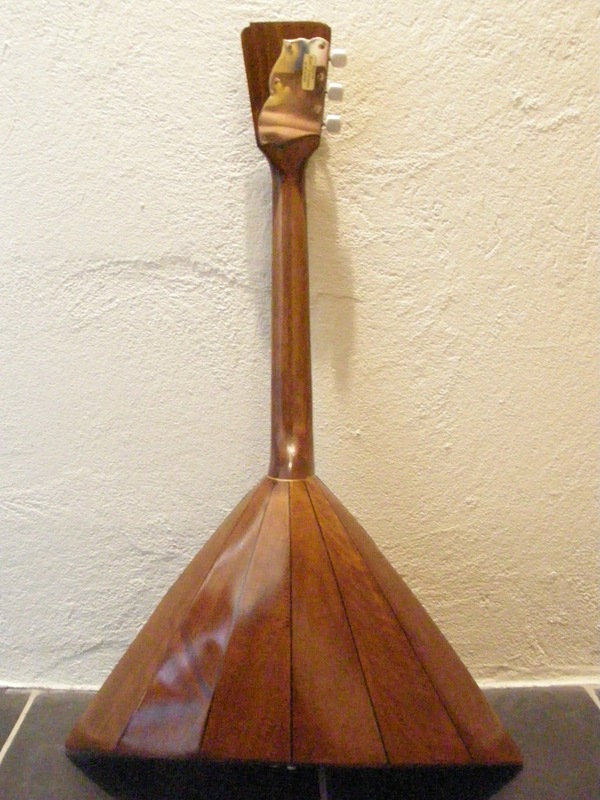 The inlays are also made from oak aswell as the knobs. There are a few details that I would improve upon if I would do it again, but I will not modify the mechanical part of , since I want to keep it intact, the only thing that I will modify more is the electronic part as I still in August 2012 haven't bought the piezo pickups for it nor have I exchanged/modified the Jazz Bass pickup on it. The weight - it is quite heavy ≈3,5 kilos versus 0,5kg on and ordinary acoustic. Oak was not the ideal kind of wood, alternatively I also could have made the body a bit thinner. 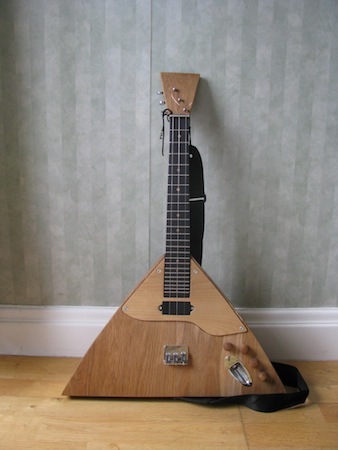 Still, perhaps it doesn't matter so much since this is the same as many electric guitars. The head of the balalajka. I should have spent more time to make sure that the dimensions of the head was perfect, I believe the upper edge of it may be off by a bit. The thickness of the neck. You need very large hands to play it comfortable, I was too careful when grinding it, and the reason for this was that I was frightened that the neck could break from the pressure of the strings. Now afterwards I have gained more insight in this and I do not think it would have broke if I have made it thinner. If you are interested I could give you quite a few reasons to this. There are also at least two ways that one might make the build easier by. The pickguard - Make it a bit bigger and remove the border on the body, it will look nice anyway, and it is much easier. 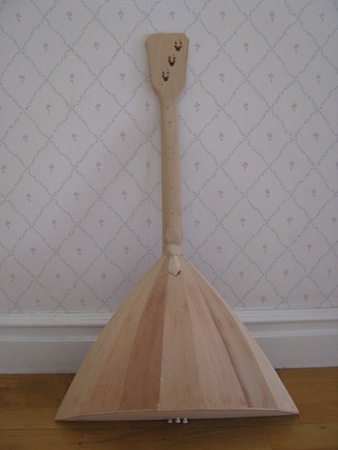 The design of the cross-over between the head and neck. If you look at the work progress you will see that I had to add a piece of oak extra on top of the head to balance the fretboard. I do not know exactly how, but it should be possible to design it so that this would not be neccessary. 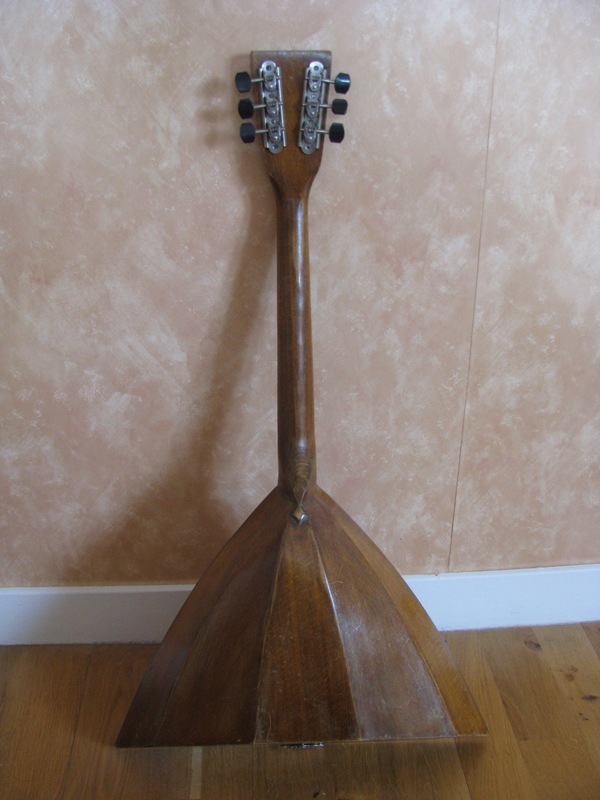 In total I paid 2103 SEK, approximately $310 or €250 for all the parts for the balalajka, more details please see the budget section.